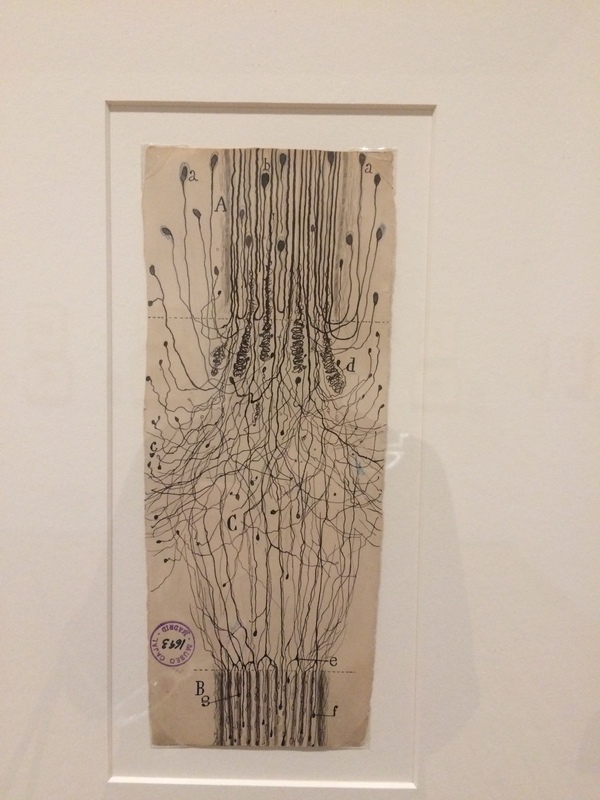 The Grey Art Gallery at NYU is currently presenting the scientific drawings of Spanish neuro-scientist Santiago Ramón y Cajal. Created at the end of the 19th century into the beginning of the 20th century the accuracy of these drawings are unsurpassed . These images are still used for scientific purposes. 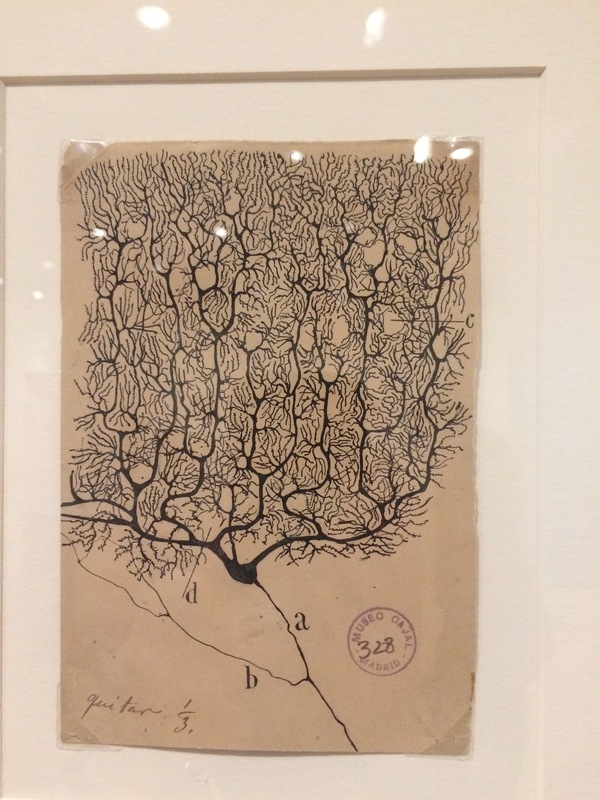 This example is a pen and ink drawing of a Purkinje neuron from the human cerebellum from 1899 shows the scientist’s skills as a draftsman. These works were all done freehand looking through a microscope there is a more to these pieces than just research. Ramón y Cajal had an artistic sense of line and pattern. This next drawing depicts a cut nerve outside the spinal cord from 1913. I think this work is a excellent representation of the contrast between an ordered system and chaos. The lines used to show axons in the center take on an almost lyrical sense of disorder. 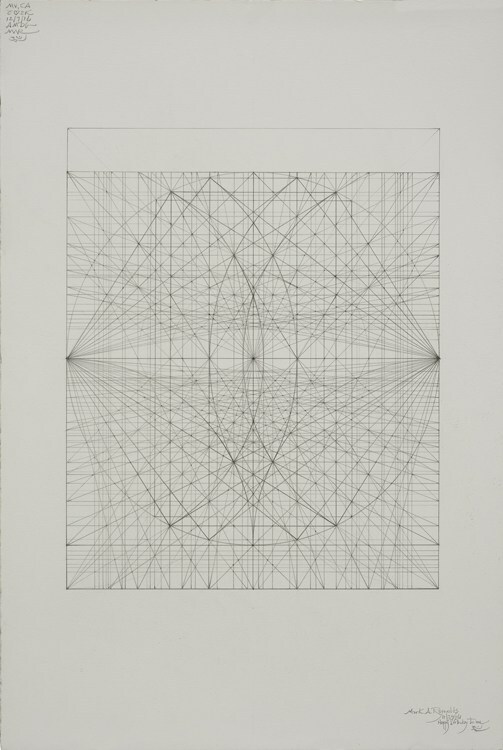 Mark Reynolds creates complex drawings of intense networks of geometric grids. The exhibition provides the public with some some sketches and studies to reveal some of the artist’s processes. There are two different ways Reynold’s starts his patterns. One of the techniques utilizes historic images. 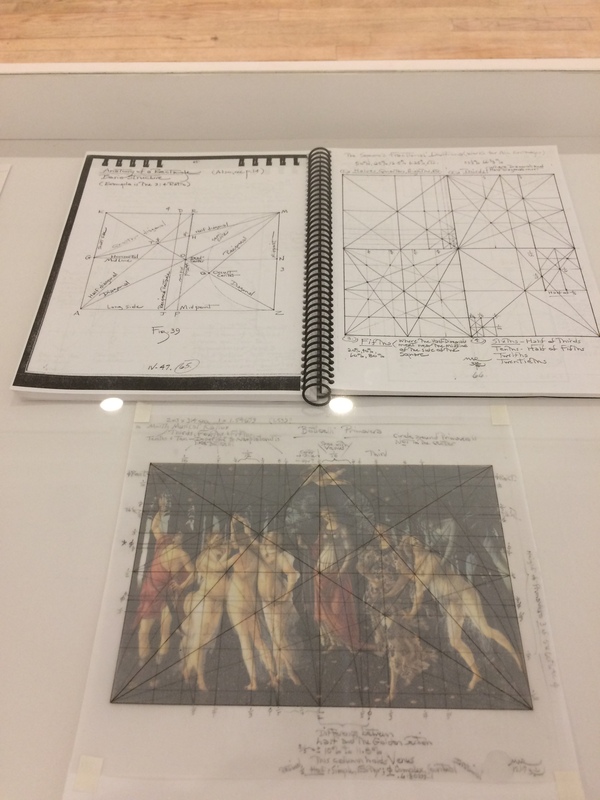 This vitrine contained a small reproduction of a Botticelli painting with a sheet of tracing paper on which a series of guide lines have been drafted. 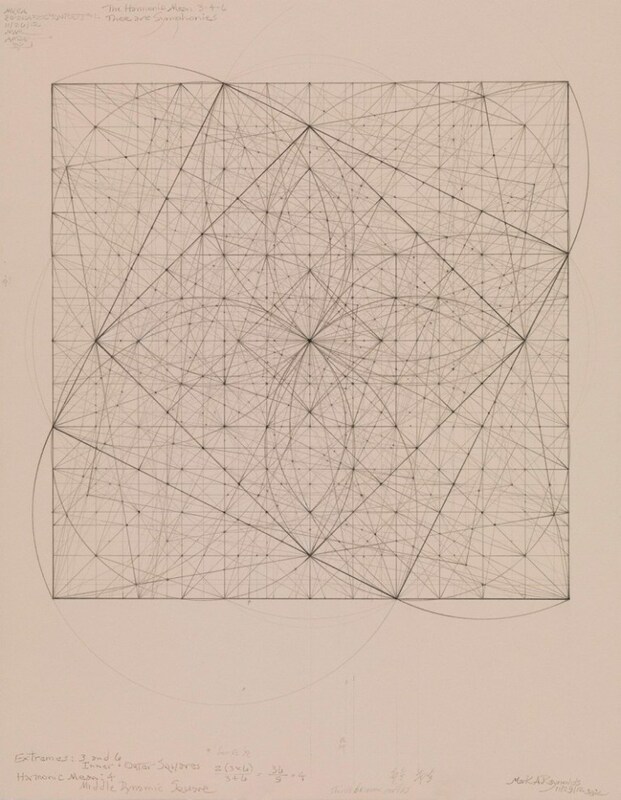 There is also a notebook with a studies for the drawings that are based completely on Mathematical phenomena. 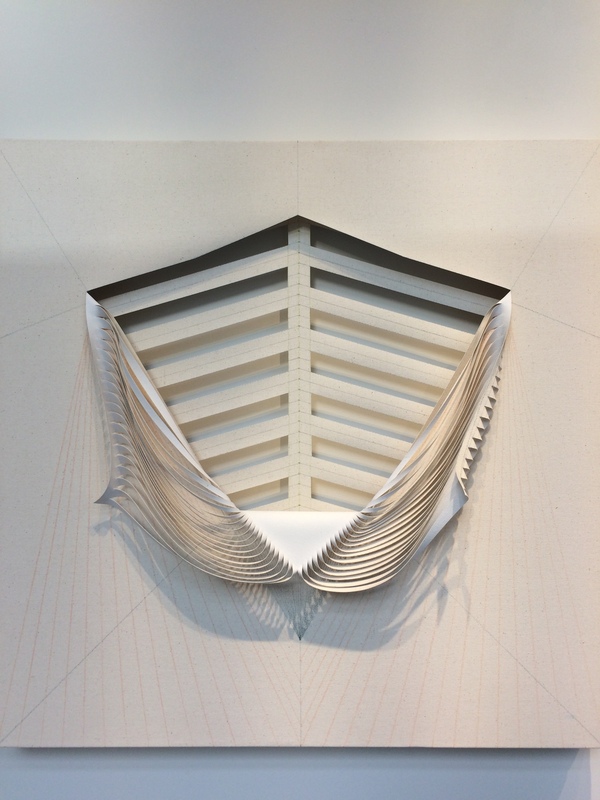 The drawing “Double Phi Series, Ideal Mathematical Space 23,11,16”, from 2016 employs both linear and curvilinear grids to fill the plane. This particular piece is more orderly then some of the other drawings at first glance it seems as though there might be two axises of reflective symmetry, but on closer inspection the two points on either side from which a series of rays emanates are not in the center of the side. There is only a vertical line of mirror symmetry. “Square Series: Generation of the Harmonic Mean, 3-4-6, 11-29-12, from 2012 presents two opposing ideas. The sequence of rotating squares provides well ordered geometric shapes while the underlying cacophony of line work gives the feeling of disorder. The detailed and precise complexity of the many layers of grids within Mark Reynold’s work unveil the order within chaotic patterning. Using a process of making precise cuts through canvas Cristina Camacho creates a very unique type of dimensionality to straight edge drawing. This example is based on a line drawing of an irregular pentagon with a vertical line of reflective symmetry. A series of lines have been drawn emanating from the two upper corners of the form featuring the same reflective symmetry. 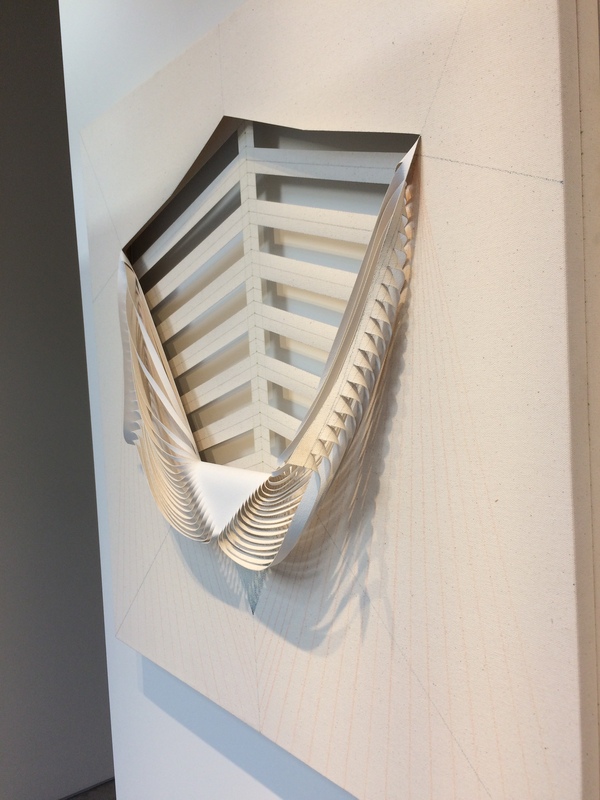 The top layer of canvas has been sliced in parallel line segments allowing the fabric to hang and drape off the 2-D plane. The underlining canvas has a series of bars parallel to the top two sides of the pentagon cut completely away. This creates both positive and negative space as well as a shadow box effect. What I find so interesting about this work is the way the shadows and especially the hanging drape of canvas make us look at a flat geometric figure in a very different way. The sculptural quality has been augmented by the obvious presence of light and gravity which play an important role in the transition from 2 to 3 dimensions.